“It was such a wonderful show and our Sub scouts really enjoyed it. Thank you very much for the wonderful entertainment you provided. It made our Blue & Gold dinner much more memorable. “[Facebook Memory] Memories from one of my favorite birthday parties, thanks again Brian Hoffman! “Thank you for a wonderful performance! The kids and adults alike loved your show. We will keep in touch!" “[Follow up re-booking] Last year you did a fantastic show at our Birthday Party on Cerca Drive. The kids had so much fun! Thank you for being part of those great memories! “Brian did a phenomenal job. So easy to work with and the music was great. So awesome"
“Thank you sooooo much! All the kids loved the show and the parents thought it was the coolest idea to have a magician at a wedding! Thank you again!!!" “Thank you so much for making my daughters birthday memorable for not just her but all who attended! We got so many compliments and how fun it was and it was all thanks to you! It was nice to have the kids be entertained while the parents got some time to talk and relax for a couple hours. So happy we found you 🙂 "
“I left a 5-star review on Google. Thank you so much. The kids had an amazing time and many parents commented how wonderful you were. I think you'll be getting some calls from our crew :)"
“Hello, Brian, it was a pleasure having you help us celebrate our daughter’ first comunión you did an excellent job. “Hi Brian, Thank you for your show on Saturday! We loved it Have a good week and we'll see you next time! “Thanks for everything, Brian! You had a tough crowd and handled them all like a champ. “Thank you so much, Brian, for entertaining the kids at Urvi’s party. The kids and their parents equally loved it and were the highlight of the party. Thank you so much. “Thank you!!! My daughter had a blast and all of her friends did too. You did such a great job with them. They are one wiggly bunch. Thank you again for making her birthday so special. “We think the kids had a great time and loved your show. My son wouldn't stop talking about it all weekend. Thank you for the best party ever. “You did great and the kids loved your tricks and dance party. We can't wait to invite you back next year. “Thank you! We had so much fun it was so great to have you at Aubrey's birthday party! “Dear Brian, Thank you so much for a wonderful party! I do not know how you did it but you kept 15 little guys engaged for a solid hour! It was wonderful. All of the parents have texted me and shared what a wonderful time the boys had. Jacob had so much fun and was very grateful for you to help make the party a success! Thank you again! We will always recommend you to our friends. You're a wonderful professional and magician! You knew just the right jokes to keep the boys rolling. I should have planned for two hours of fun! Many Thanks Again! “Hi Brian, It was awesome having you at my son's birthday party, you definitely had the kids and my family entertained! Once again, THANK YOU SO MUCH FOR COMING TO JACOB'S BDAY PARTY AND HAVING US ENJOY YOUR SHOW! “Thank you Brian kids and adults did enjoy your show. Thank you again. “The kids had a great time! Thanks! “Hi Brian, Thanks! Everyone said it was a great party and they had a blast! I have a feeling, we will meet you in some SCV activity soon! “Brian is highly recommended - 5 stars. “The kids had so much fun watching you and they were laughing non-stop!!!! Henry had a blast!!! He said his favorite part was the magic wand! He also liked the Taylor Swift song with the funny mouth! Thanks again!!! “I have known Brian for years. I'm glad he has pushed on. Good with children. “AMAZING! I hired Brian for my son's 4th birthday party. He had around 15 kids to entertain. He did amazing! Great games before the magic show, fun magic show and age-appropriate magic and great games afterwards. He incorporated the parents in a few tricks but not too many which is great. Parents had time to enjoy the party and relax while the kids where all entertain the entire party! I told him I was looking for a stress free party... and I got a stress free party! I entertained the parents, had time to eat and drink! Everyone loved him! “Hi BRIAN I really want to thank you very much for making Xuri's 3rd bday party so much fun! The kids had a blast! “Brian did my sons birthday party and was phenomenal! We chose the party where he came and taught the kids magic trick and then they practiced the tricks ... it was great! He was very engaging and the party was at Bucca Di Beppo and Brian made it probably one of the best birthday parties my son had ever had. He was very engaging and entertaining. He also provided me with a list of everyday items that I bought at the 99 cent store for the goody bags which were items he used in the magic tricks so the kids could do the tricks on their friends and family after the party! I give Brian a five-star rating because he is the best and my kids still talk about that birthday party! “I have seen Brian on several occasions, from the Kids Expo, birthday party and at the Blue and Gold dinner in my Scout group. Every single time he was able to deliver an entertaining and exciting show for kids and grown-ups. He has the right amount of humor mixed with good magic tricks that always lets you wanting and waiting for more. You can't go wrong with Brian Hoffman and the Santa Clarita Magic Company!. “We have seen Brian Magic at various events and he always delivers fun, laughs, and magic. The kids love the show and he understands his audience. He customizes the show to the moment and keeps the audience engaged. Absolutely a 10! Thank you, Brian!! “We hired Brian for my son's seventh birthday party. He entertained a dozen or so kids for two+ hours while the parents relaxed and mingled. The kids loved his goofy humor and magic tricks and he kept them engaged throughout with party games and music. All of the parents remarked that he was a great find and that they would consider hiring him for parties in the future. Highly recommend! “I've known Brian for years and finally got a chance to check out one of his magic shows at a local Boys and Girls club. The kids were all over his goofy humor and smooth tricks, and any time you can keep my kids occupied for more than 30 seconds, you're a saint! His prices are affordable compared to other magicians in the area, and even though this is sure to inflate his ego, he's genuinely a nice guy who you're happy to have at your event. And don't tell him I said this, but if you ask nicely, he might even swing dance with your grandmother for no extra charge! “Brian is a professional, reliable performer who is really dedicated to giving 110% to his audiences at every show I've seen him perform. “They had a great time!!! Sam really enjoyed it, and you did an amazing job trying to keep them involved. I think anyone else would have been at a loss. “We loved it !! Thanks for everything !! 5 Stars!! “We enjoyed your performance! Can't wait to have you back next year! “We loved the Holiday Hocus Pocus Magic Show hosted by Brian, during the Festival of Trees!!! My 7 yo (who is not easily impressed) enjoyed the entire performance and didn't want to leave at the end. Brian was funny, professional, and an overall great magician!! Thanks you for a wonderful evening! “Thank you, Brian, for providing such a fun, entertaining birthday party for our son Shaun. Brian has a great personality and relates very well to kids (our son was turning 10 so his friends are all around that age). You could see the kids' eyes lighting up as they learned how to perform tricks themselves. 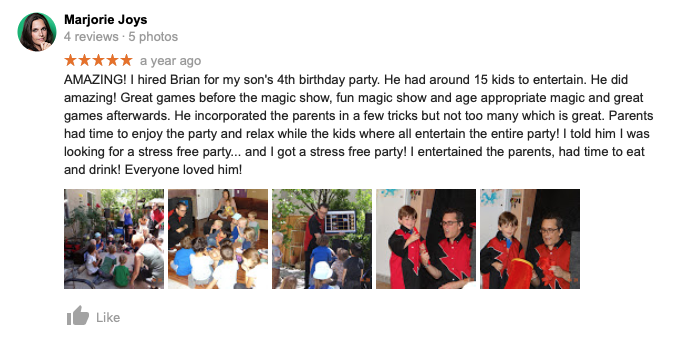 Our son really wanted a magic party for his 10th birthday and Brian was the perfect fit for what we needed -- rather than just entertain the kids, he teaches them how to do magic, which is very exciting for them. He also is very reasonable with what he charges and I felt it was one of the best, most laid back parties we have had. Thanks again, Brian! “Awesome magician! You really entertained the kids & adults (wide range of ages)! Came promptly and got the kids excited right away. Thank you for providing the best entertainment for my 6-year-old son's birthday party. “Brian is without question, one of the best shows in town. My son birthday party was memorable. Both kids and not so kids had a blast. He was on time, professional, enthusiastic and he was able to identify when to engage kids and when to let them enjoy. My son and his friends still talk about it. Brian is absolutely the best. “Brian and Razzle Dazzle has been MC and magician for several of our local Cub Scout events, over the years. Brian was made for this! He does "magic" that makes everyone laugh out loud (not only the children.) His personality is so uplifting, charming, and fun to be around. I have personally seen Brian do shows at weddings and also at the Santa Clarita Festival Of Trees, where his commanding MC abilities shone brightly. Brian keeps everyone in the audience captivated and engaged. I highly recommend Razzle Dazzle for your next fun event! “You are the best party entertainer I have ever seen! Every parent at the party said that was the best two-hour kids show they have ever been to! I could not believe the amount of energy you have to do everything that you did for the kids From the magic, music, balloons, and my favorite moment at the end, you did the most spectacular job! I was so worried about having 40 kids at Jacob's birthday party but you ran the show! I'm in education so I see shows like this all the time at schools, at other birthday parties, but every parent said this was the best!!!! Jacob was smiling the entire time! He loved his party!!!! Usually, it's little girls on the dance floor, but you had everyone. The little guys were so engaged in everything you were doing and having so much fun! I cannot thank you enough for the entertainment, giggles and amusement that Jacob and all of his friends had yesterday! You are the best investment for a party!!!! 40 children!!!! Wow!! I cannot believe it! You're the very best!!! Thank you so much!!!! “Brian has performed his magic show at the Antelope Valley Amateur Radio Club's annual Christmas dinner for the past 4 or 5 years. He is very entertaining and funny. He puts on a good show and involves the audience in his magic tricks. Whenever the discussion of the Christmas party comes up, the members always ask for Brian. “Brian's shows were amazing! He was able to engage kids from age 4 to 12 at our cub scout ice cream party and the elementary school Halloween carnival. The parents also really loved the show. He is the full package magician, comedian, dance party host, & balloon artist. His energy and enthusiasm is contagious. I would recommend him at any event, if he is there it will be a success. “Brian was the perfect fit for what we needed -- rather than just entertain the kids, he teaches them how to do magic, which is very exciting for them. He also is very reasonable with what he charges and I felt it was one of the best, most laid back parties we have had. “Thank you so much for doing the show! All the kids had s great time, you kept them entertained and I was laughing quite a bit as well! We all had a great time! We will definitely recommend you to our friends and people we know! “I recently attended a birthday party where I had the opportunity to see Brian in action. I have many years of experience in traditional education as well as educational enrichment programs. I don’t recall ever seeing a group of children so engaged as they were watching Brian’s show. It was an impressive sight to see how he masterfully entertained the children without losing control. My daughter had a great time! “Thank you, Brian, for such a wonderful show at my son's 5th birthday party! Everyone including the parents really enjoyed it! My son cannot stop talking about your show! You made his party a memorable one. You're a pleasure to work with! “Brian's show was fun and entertaining. In fact, I had recently attended a separate birthday party that had a children’s magician. I couldn't believe the difference between the two shows. Although the children certainly had a good time at both shows, Brian’s show absolutely stood out as being the hands-down favorite based on my daughter’s feedback and the overwhelming response from the children. “Dear Brian: Our family recently saw the Fund Raising show at Toland Way Elementary and as I mentioned to you after the show, you truly made the show “happen”. The “kids”, our children really liked you and our son Anthony thought it was great to be your assistant. By the way, you have the patience of a Saint!